DC Dana: Behind the Curtain: Second Edition "
I was chatting with new friends who grew up in Ecuador and they said something funny that resonated with me. They explained that when they were growing up, they would see these people from America come there to teach English and they thought those teachers were so motivated and admirable...but now that they live in the U.S., they realize: those teachers were just restless college kids who couldn’t figure out what to do with their lives after graduation. I’ve thought about stuff like that before. Like when my college friends started becoming teachers, I saw my beloved elementary school teachers in a whole new light. I knew my friends were staying out late on the weekends, having parties, dancing like idiots, and making out with strangers. Was Miss Plough also doing that when I was in kindergarten!? It reminded me of a post I wrote a few years ago about how it is when you see “behind the curtain” on things in life. So many things I thought would be a certain way, or were unattainable, really aren't when you get the inside scoop. So I thought I’d update that post a bit and re-post. I’ve mentioned that I have an insatiable urge to experience everything. 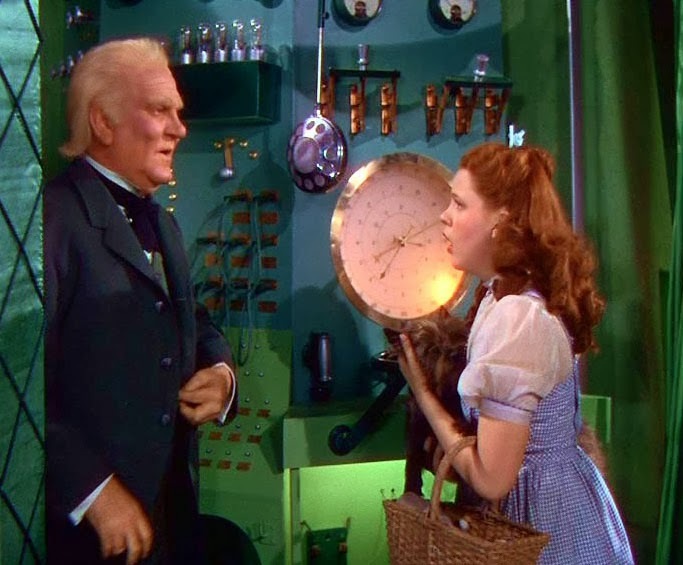 I’m not satisfied unless I feel like I’ve seen behind the curtain – like in the Wizard of Oz. Everything in life to me is like this amazing, intriguing thing on the outside and I just have to go behind the scenes and see what’s really going on. It might’ve started when I was little. I recall a school carnival that included a haunted house. I went through once and was freaked out. But I dropped something when I went through so the people running the haunted house stopped being scary and took me through the whole thing backwards so I could retrace my steps and find the thing I lost. All these goblins and witches were now being nice and concerned for me -which was trippy for a little kid!- and I got to have an inside look at how this haunted house thing really worked. So yeah, that’s probably where this whole “I must see what’s really going on” obsession started. Because not only did that experience cure my fear of those haunted house things, but when you’re in elementary school and you get to “cut the line” and be personally escorted by a ghost, you start to feel powerful! And that thirst for power curiosity to see behind the scenes has followed me into adulthood. I’m always trying to get an insider’s view of things. Like what’s it really like to run a marathon? (long). Or wouldn’t it be cool to work in one of those secured government facilities where you need a special code to get in? (it wasn’t. I had to leave all my electronics at the door and I couldn’t IM my friends on gmail if I got bored…) Or wouldn’t it be awesome to be in a rock band and perform in front of crowds? Ok that actually was really awesome. But sometimes I’ve had moments where I’ve gone behind the curtain and didn’t stop to even realize it.. Like being a consultant. I remember doing research (In books. Before Google. Life was hard.) on the different career options for business majors and I came across a description for: Consultants. I thought it sounded awesome. 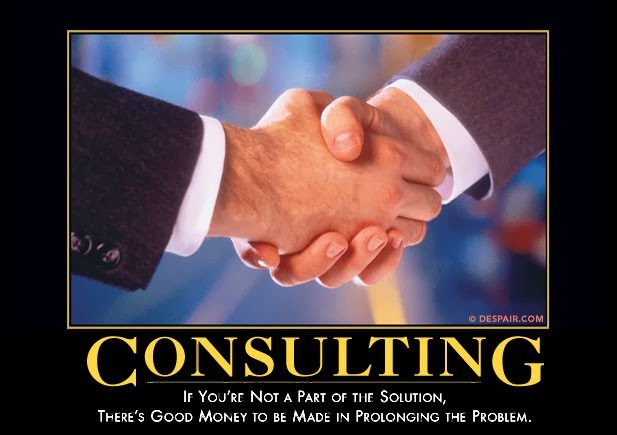 “Consulting.” You don’t have to do math, or become an expert in something boring, you just …consult people on things. You advise. And you can bounce around and do it in a lot of different places. Considering my main fear in life is boredom, I thought this sounded nice and squishy. Not pigeon-holing myself into something that might get old, but just flitting around in a suit advising people on ….things. - “oh those contractors” – as in: federal contractors are a lower form of life than those direct employees of the government, obviously. Yep. Those consultants who make the big bucks but no one knows what they actually do. Harumph. In reality, many people do go from politics to consulting, and it sounded really similar to direct government life, so I went for it. And it wasn’t until years later - when I was wearing a suit, sitting around a boardroom table, as a consultant- that I realized I accidentally got my college dream and didn’t even realize it happened. I had gone behind the curtain! And just like those witches and goblins from elementary school, it turned out that this thing wasn’t what I pictured once I got on the inside. First of all: suits are constricting, you guys! "Party clothes are so binding..."
Don’t get me wrong, I love my job. And sometimes being behind the scenes of things is just as awesome as I imagined. And honestly, I now try to step back and take it all in at various points in life so I don't accidentally skim over realized dreams because I'm too busy rolling my eyes at the reality of what those dreams end up entailing once I'm on the "inside." But that's the beauty of continuing to explore. Sometimes the "inside" is even better than you hoped for. ...or sometimes it's just a little nerd back there pulling strings.